I bought ready-to-cook galettes, the savoury, Breton-style pancake. 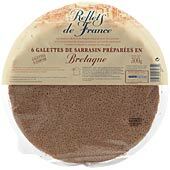 In the UK you can get them from the Reflets de France brand at Ocado. They’re sold in packs of six. Pop a knob of butter in a frying pan and, once melted, place a galette darker side down in the pan. Immediately start to place your filling ingredients on one half of the galette, wait for the edges to brown a little and flip the other half across the fillings so that you have a perfect half-moon oozing with deliciousness. Make sure both sides have been adequately heated (this involves a bit of flipping for the culinary gymnasts among us) then place on a plate and set aside. In the meantime, heat the oven to about 150 Celsius. If, like me, you have an audience who will eat the galettes as fast as you can make them, and if you prefer to eat at the same time as those you’re cooking for, this is a useful trick – wait until about a short while before you want to serve the already-filled galettes, slip them into the oven for 10 minutes and they will be piping hot, as if they came straight from the pan, when they arrive at the table. The Classic Complète. Place thin slices of ham (honey roast is delicious if available) to cover half of the galette. Crack an egg on top and allow it to start to heat through, but don’t leave it so long that the galette burns. It can always continue to cook a little once in the oven. Sprinkle with grated cheese, and/or a little parmesan. Grind black pepper over the whole and close. When in half-moon shape, i.e. the fillings are covered by pancake, flip to ensure the egg gets heat from both sides. If you’d like to be a little more ambitious with the presentation, place all the ingredients at the centre of the galette, leaving about 5 centimetres uncovered around the circumference. make sure the egg is situated as close to the centre of the galette as possible. Fold in 4 edges, leaving the egg exposed but creating a roughly square shape. Serve. The Neptune. Arrange slices of quality smoked salmon to cover half of the galette. Dollop three tablespoons of creme fraiche on top of the salmon and spread. Sprinkle chopped chives (dill also works beautifully here) and a little parmesan cheese over all. Close as the salmon’s colour starts to turn pale but before the galette edges start to curl. The Vegetarian Italian. Put thin slices of mozzarella around half of the galette, dot with 5 or 6 cherry tomatoes, sliced in half. Sprinkle with parmesan and chopped or torn fresh basil leaves. You have to keep an eye on this one because if you leave it in the pan for too long the tomato juice will make it soggy and difficult to flip. One solution, if you have time, is to use regular slicing tomatoes and remove the juicy flesh and seeds beforehand. As for the galettes, heat a knob of butter in the pan and place the crêpe darker side down in the pan. Sprinkle about 2 tablespoons of sugar across one half of the crêpe, squeeze the juice of half a lemon over the sugar, add a dash or two of cinnamon, fold in half and serve. An optional extra might be a squirt of chantilly or a scoop of proper vanilla ice cream. If I weren’t so convinced I’d set my head alight, I might attempt Crêpes Suzettes, but for the moment I leave that to the experts in restaurants like Les Halles, where they’re so practised that I couldn’t hope to compete. You are making me hungry again. The words “Shrove Tuesday” popped into my head last week when I was talking to a church going student about “Ash Wednesday”. I haven’t thought about “Shrove Tuesday” in 20 years. What do pancakes have to do with anything anyway? 3 tablespoons of what? … just curious … and proving that I did read all the awesome recipes.